It’s no secret that Denver is a terrific base camp for ski and snowboard adventures in the nearby mountains. What may come as a surprise is the fact that The Mile High City has the only urban snowsports terrain park in the United States. Ruby Hill Rail Yard launched for its 12th season on Jan. 10, 2018, and remains open through the end of February if Mother Nature showers snowy blessings and cooler temperatures on enthusiastic jibbers. The free attraction with 13 boxes, rails and other features is made possible through a partnership between Winter Park Resort and Denver Parks and Recreation and the help of a dedicated team of volunteers. The unique arrangement is due to the fact that the City and County of Denver owns Winter Park Resort, located only 75 miles from the city. “It’s a really special opportunity to bring a recreation experience to an urban setting for families that can’t make it to the mountains,” says Steve Hurlbert, director of public relations and communications for Winter Park Resort. When Ruby Hill Rail Yard opened for the first time on Jan. 9, 2007, Denver Mayor John Hickenlooper (now Colorado’s governor) was interested in new options for the community’s underserved youth. Winter Park Resort’s Bob Holme, now director of mountain maintenance, sprung into action and brought snowmaking equipment and a snowcat to the city. Each year, a team of Winter Park volunteers builds the park, installs the features and handles the initial grooming. Volunteers provided by Denver Parks & Recreation take over and help maintain the terrain park while it’s open. Approximately 3,000 checked out the terrain park in its first year, with the number quickly doubling the following year. Lights were added in 2008, and the number of people enjoying the attraction has soared to around 9,000 locals and visitors annually, Hulbert estimates, depending on how long Ruby Hill Rail Yard can stay open for the season. Over an acre of snow that is 2- to 3-feet deep is made during the middle of January in hopes that it will last several weeks. 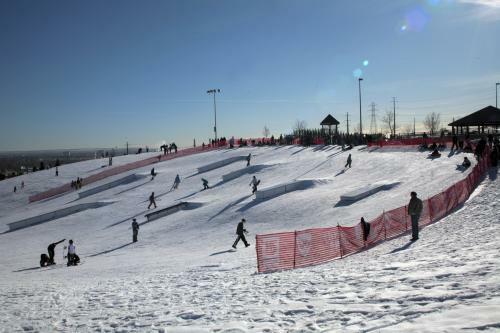 The terrain park’s northeastern exposure reduces the angle of midday sun, which helps prolong the snow&apos;s disappearance, and the high water content of manmade snow also helps extend longevity. 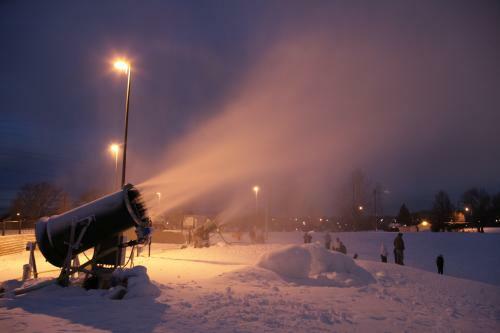 Ru by Hill Rail Yard is open every day from 5 a.m. to 11 p.m., and the terrain park lights stay on from dusk until 9 p.m., providing plenty of time for all ages to get out for some mountain-style fun. Key to being free is that you must bring your own equipment. There also is no chairlift or rope tow, so skiers and riders hike up the 250-foot hill for each run. It’s worth the effort! Ruby Hill Rail Yard is part of the 88-acre Ruby Hill Park, located off of South Platte River Drive and West Florida Avenue, and was named for the red garnet-colored stones found in the adjacent Platte River. The park has long provided all sorts of opportunities for year-round activities such as snow sledding, baseball, softball, swimming and playground fun. From the park&apos;s high bluff, used years ago by Native Americans as a lookout point, visitors can savor a stellar view of Denver&apos;s majestic skyline. Photos courtesy of Winter Park Resort.